Gluten is a composite of proteins found in wheat, barley and rye. (It is made up of Gliadin and Glutenin). Wheat flour is made up of gluten and starch. The gluten is the part that makes dough elastic, which is why wheat is so popular for making bread. 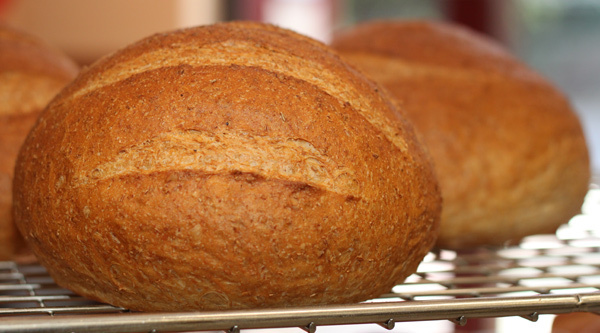 Having elasticity allows bread to rise without crumbling, falling apart or losing its shape. If you want to see what pure gluten looks like, try kneeding a ball of wheat flour dough under cold water. The starch will gradually dissolve in the water, leaving behind a ball of gluten. What is the deal with this whole gluten free thing? Many people have a medical condition called coeliac disease and get very sick after eating gluten (even in fairly small quantities). There are several reasons why you keep seeing so many references to gluten and gluten free foods. Diagnosis: There is a much better awareness of coeliac disease among doctors these days, so far more people who have the condition are being diagnosed. The only reliable treatment is currently a lifelong gluten free diet. Customer requests: Many cafes and restaurants have noticed that many customers request gluten free meals so have developed gluten free options to keep customers happy. Money: With so many people following gluten free diets, many businesses have found it to also be highly profitable to cater to the demand for gluten free foods. Do NOT stop eating wheat! Seek medical advice: visit your doctor and request the blood test. It's fast and convenient - you'll have an answer in less than 2 weeks. Both the blood test and the traditional bowel biopsy procedure give false negatives in coeliacs who are not eating wheat. It is also a bad idea to go on any sort of drastic diet without medical advice as it can lead to deficiencies. Please see our Gluten Cheat Sheet for a good overview. Although only a small proportion of the population have coeliac disease (0.5-1%), this is still a very large absolute number. And for every coeliac there are up to 10 non-coeliacs who are on gluten free diets for non-medical reasons. You're welcome to point out to them that it won't help them to lose weight and is very unhealthy, particularly if many foods that normally contain gluten are substituted for gluten free versions. (Eating only foods that are naturally gluten free can potentially have health benefits if you do it right, but most people don't). Of course as a coeliac myself, I'm quite happy for non-coeliacs to buy as much gluten free food as they like because it helps drive improvements to variety, quality and cost in the gluten free market place. And as any coeliac will confirm for you, most specialty gluten free products are horrendously expensive compared to their wheat based counterparts. This information is supplied in good faith by a Coeliac who is not a medical expert. It is not exhaustive, nor guaranteed accurate and is not medical advice. Always consult your doctor before making dietary changes.